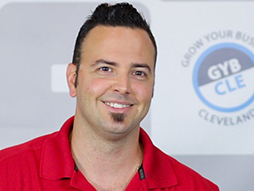 In this episode Anthony Quagliata, Marketing Expert, Chef, and Mister Mom shares 3 Essential Tips To Win Over Customers At Your Next Trade Show. After the tip, we go backstage where Anthony shares his stories of, Music to Marketing, The Values of Family Business, A Chicken Parm Love Story and more! I’m Anthony Quagliata, owner of AQA Marketing, and I’m here to show you three essential tips on how to win over customers at your next trade show. These three tips are very important in making sure that your brand reaches the customers. The first tip is very important. Your logo is your business. Having a sign, having a table cloth that has a logo on it, is going to get the customer’s engagement. For example, having a table cloth with your company’s logo will not only get the attention of your business, but it makes it stand out, because not a lot of people do that. They’ll have a blank table cloth, and people just walk right by it. With your logo on it, they’re going to stop and go, oh, that’s what you do. It’s going to really make an impact because there’s going to be thousands of people walking around, and they’re going to see you and want to come to you. Number two, when customers actually approach your booth, you want to be able to have product samples, or a demonstration, or something to try your product if it’s a food product, because people want to interact with you, and they want to have that experience of what separates you from the other people. I can’t tell you how many times people have a booth, they spend thousands of dollars on these booths, and they don’t even have a product that they’re trying to sample, or giving out to people. They want to be able to connect with you, and they’re just like, yep, this is what it looks like. Thanks a lot. Are you kidding me? The third and final point, when you’re at a trade show, and your customers leave your booth, you want to have something tangible to give them, like a key chain, a pen, a mug, something that represents you, but it’s something that they’re going to take home with them, or back to their office, and they’re going to remember the conversation you had, and they’re going to use your product. A giveaway I like to recommend is a USB flash drive. People use it all the time. It’s great portable technology and storage, and you can even have your own information preloaded, so that way when a customer gets it, they can go back, plug it in their computer, and they could see kind of like a PowerPoint presentation, or a little outline of what you do. Or if they want to, they can just keep on using it for other reasons, plus it has your logo outside, so it’s always on their key chain, in their pocket, at their desk, anywhere you go. After following these three simple steps, you could definitely win over new customers at your next trade show, and build your brand. AQAmarketing is a full service printing, apparel, and design firm. We specialize in logo & graphic design, custom decorated apparel, full color printing, logoed promo. products, banners & signage, print advertising, and creative culinary services. We make your brand stand out from the rest. Call me, 440-725-8347, and we can discuss your vision! Click here to find out more about Anthony Quagliata.